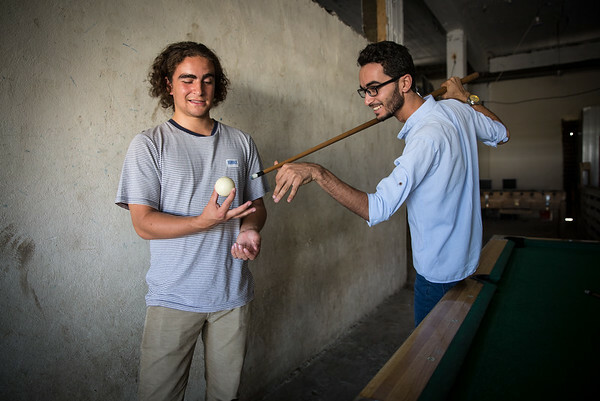 Ahmed and Marlon played pool in the place that Ahmed likes to spend time with his friends in between his studies and volunteer work. Marlon did not stand a chance against Ahmed, but lost in style. Ahmed is 23 year old . He is from Aleppo in Syria but fled to Lebanon five years ago due to the Syrian conflict. Ahmad tells a story of a beautiful Syria where people were happy and children went to school. Syria was safe and no one in his surroundings had experienced war, people loved and cared for each other. However, their lives were disrupted when the war in Syria started in 2011.